Joel Catering created Il Mercato to bring special events to life in the heart of the Lower Garden District. The remarkable Spanish Colonial style building, originally designed in 1931 as a neighborhood market, maintains the same open and inviting ambiance for guests today. The recently renovated space exudes a distinctly European feel, featuring a classical courtyard and sweeping main hall with sumptuous, thoughtful details throughout. The Old Ursuline Convent is one of the oldest buildings in the Mississippi Valley, originally built in 1752. Until 1824 it was a convent, an orphanage, and a girls’ school operated by the Ursuline nuns. Now the designated National Historic Landmark in the old French Quarter houses a museum and an incredible event space. 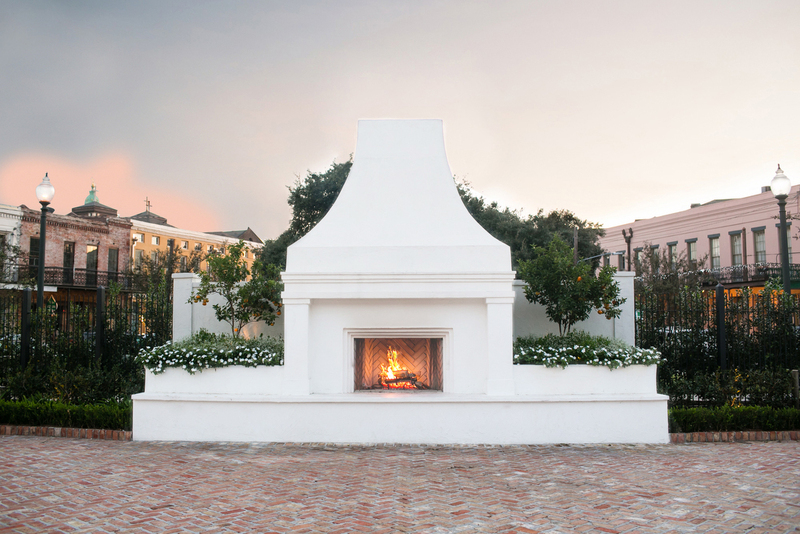 An 1830’s Creole cottage and accompanying buildings on the Lower Garden District’s riverfront comprise Race + Religious, an event space voted as “one of the world’s coolest rental houses.” This stunningly restored relic of a bygone era is the perfect setting for a quintessentially New Orleans event. This impressive building located near the French Quarter was originally a Catholic Church designed by French architect Theodore Giraud and built in 1853. Now known as a “church of the arts” which hosts performances of music and dance, the Marigny Opera House is a dramatic and spacious venue. The airy cathedral ceilings, bare walls, and artfully tiled floors create a striking backdrop for elegant weddings and special events. New Orleans’ oldest fine art institution, NOMA originally opened in 1911 is the home to over 40,000 pieces of art. Various galleries are available for weddings and other events, as well as the Besthoff Sculpture Garden, one of America’s most important installations of over 60 sculptures in a stunning setting complete with beautiful flowers, lagoons, and 200-year-old live oaks. The original Canal Bank & Trust building was designed by Emile Weil in 1927 and operated as a bank for almost 90 years. Complete with meticulously preserved details, the original bank lobby now serves as The Capital on Barrone, a captivating and impressive venue. The gilt trim, ornate marble columns, and soaring ceilings provide an unmistakable air of gravitas and luxury to the events held there. Whether you're planning a meeting, social event, or wedding, Hampton Inn & Suites New Orleans-Convention Center is the perfect choice - with an array of indoor and outdoor event spaces and an ideal Warehouse District location. With onsite catering and event planners, we can help you dial in the details so you can focus on your event. This charming historical house located on Chartres Street has a storied past and lively present. Built in 1826 and restored in the 1970s to its post-Civil War style, it has been maintained as a museum and event space. With its blithe yellow façade, cozy interiors appointed with period furniture, and a stunningly manicured garden, the Beauregard-Keyes House is the perfect setting for an intimate event surrounded by history. sugar holding facility is a “raw space” whose 25,000 square foot main hall and 15,000 square foot courtyard can be rented together or separately and easily transform to accommodate the original design of your event. The Octavia Art Gallery, established in 2008, has the mission of “preservation and conservation of unique and authentic artistic cultures worldwide.” Events hosted in this airy minimalist gallery are surrounded by compelling contemporary art from national and international artists. flickering glow of over 40 handcrafted, open flame, copper lanterns in their museum showroom. The Contemporary Arts Center is a unique location which offers two distinct venue opportunities: the warehouse provides a blank canvas which can be customized to suit any sensibility, or you can choose to stage an event within the galleries surrounded by fascinating contemporary visual art. This gallery near the French quarter features paintings, photographs, and sculptures from emerging and established artists, providing a dynamic and unique backdrop for evening events. Also available is the stylish ballroom which features dramatic chandelier lighting and marble floors. Gallier Hall, which served as city hall for over a century and was the setting for many important events in NOLA history, is now an impressive event venue in the Central Business District. The Greek revival style building was completed in 1853 and features Tuckahoe marble and fluted Ionic columns. The Pitot House is the only Creole colonial country house open to the public. It was built in 1799 on historic Bayou St. John and has a long and storied history. After functioning variously as a private home and convent over the centuries, it now houses a museum and is available for indoor and outdoor events of up to one hundred people. Originally built in 1906 and renovated to its original glory in 2011, the Civic is a venue known for its infinite customizability. The tremendous space features modular floors and cutting-edge technology and can be transformed to suit any event and imagination. The Cabildo, located in the French Quarter’s Jackson Square, was designed by Gilberto Guillemard and constructed in 1799 under Spanish rule. Later, it was the site of the Louisiana Purchase Transfer. Meticulously restored after a fire in 1988 and opened to the public in 1994 as a museum, The Cabildo is the perfect venue an event steeped in the fascinating history of New Orleans. Established in the heart of the French Quarter, the Preservation Hall was established in 1961 to dedicated to honoring the unique American artform of New Orleans Jazz. The historic Creole mansion was built in the early 1800s and infuses every event hosted there with the indomitable spirit of NOLA’s vibrant music – past and present. The Mazant is a stunning bed and breakfast which can also be rented out for special events. With an interesting history reaching back to the early 19th century, this property includes the stately home with elegantly appointed rooms, surrounded by two beautifully landscaped lawns. Located in Louis J. Dufilho, Jr.’s apothecary, America’s first licensed pharmacist, the New Orleans Pharmacy Museum is an event venue full of unique character. Peruse the museum inside and host your special event in the spacious tree-lined courtyard which exudes classic NOLA glamour. Established in 1999 and located in the historic Warehouse Arts district, Ogden Museum is home to the largest collection of art from the American South. The museum consists of two distinctive buildings available for events: the historic Patrick F. Taylor Library designed by Henry Hobson Richardson in 1889, and the modern glass-and-stone Stephen Goldring Hall. The most sophisticated and sprawling event complex on the Mississippi. Whether you have an intimate group of 20, or a dynamic group of 20,000, our expert event planners will make your event shine. Eclectic and modern touches enhance the allure of this restored 18th century Creole townhouse. The 35-room boutique hotel features three distinctive event spaces – the rooftop terrace, café, and courtyard – equally suited for a seated dinner or a lively cocktail party. Exposed original brick walls, Venetian plaster, artworks by prominent local artists, and upward city skyline views provide texture and intrigue for truly unique and dynamic events. The Colonial-style Bea Field Alumni House at Tulane University, which was built in 1941, is a charming venue for special events. The beautiful redbrick home is elegantly appointed with a great room, a spacious patio, and an artfully manicured front lawn.